PRO-RIDE® CHASSIS: The INDY® Adventure 144 is built on the PRO-RIDE® chassis that is 300% stiffer for precise, intuitive handling. The ideal choice for a nimble handling sled that is fun to ride. COIL-OVER REAR SUSPENSION: Designed for better flotation and deep snow performance with improved on-trail ride. By eliminating the torsion springs and redesigning the torque arms, the skid weights substantially less. RACE-PROVEN FRONT SUSPENSION: Lighter steering, sharper cornering. 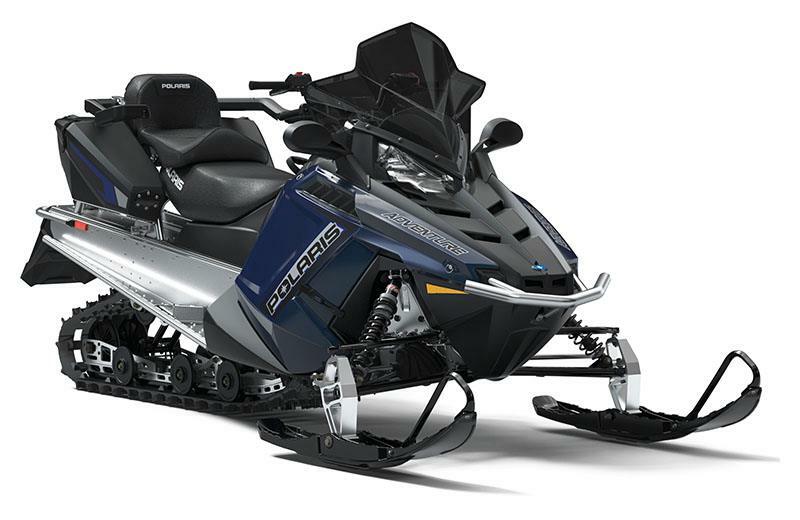 Developed with the Polaris® Racing Program, the performance and durability of the INDY® Adventure 144 were proven in extensive on- and off-track testing. ADVENTURE CARGO SYSTEM: The Adventure Cargo System features a rear aluminum rack that can hold cargo and the innovative Lock & Ride® Saddlebags. These spacious bags can be installed or removed in seconds, without tools. They lock securely onto the sides of the rack and provide convenient, protected storage that expands every rider's travel options. EXTREME FRONT BUMPER: Lightweight, aluminum front bumper features protection for wherever your INDY® Adventure 144 takes you. HANDLEBAR AND STEERING POST ANGLE: The INDY® Adventure 144 design has a 15-degree flatter steering post angle developed for sit-down and standup riding comfort and flexibility.